for March 28th are Glorious. He is love and He loves. Christ when we are loving. the deep heat of His love. The world needs My love. Will you love for Me? What am I now doing for Christ? R. On December 5, 1996, Our Lord appeared to me at Holy Cross-Immaculata Church, after Mary had appeared on most of the 5ths since July 5, 1994. Our Lord now appeared, dying on the cross. His withered body was horrifying to me. I cried and looked at Him in horror. This lasted about twenty minutes. It looked as if He could exert no effort, but His jaw moved and moved and moved. It was a big movement as His mouth moved. I heard no words. I was sickened. I was horrified at the sight of His weakness, the vision I saw and I cried from the depth of my soul as I watched I could hardly stand it. It was in the church, Holy Cross-Immaculata. He appeared on this crucifix. It was horrifying for me. I was in such anguish and tears. I know this experience so well, He implanted it in my soul. This was after Mary appeared for 2 years and 4 months on the 5ths. Jesus appeared on the 2 1/2 year anniversary on the crucifix. At the traditional rosary (I had done them now for 2½ years of 5ths) that evening at 6:30 with all the Shepherds of Christ people there, He said He moved His mouth because no one was listening. This was December 5, 1996, after all those visits of Mary on the 5ths when very few came and listened. Mary did not appear. Jesus is handling it. He is speaking in the rosaries and in the Blue Book messages. In the year 1996 Mary began to speak less and less in the live rosary messages because she said people were not listening. selfish disobedience to God's will? They lied about what Jesus said. We say — "no God"
The devil wants us to say "I will not serve"
They beat the Lord of truth! (9) R. "Behold the Man"
Should I crucify your King? I am Jesus, Son of the Living God, and they laughed and mimicked Me! Oh, such hardened hearts! How vile can men’s heart become? The devil’s grip is paralyzing and crippling. 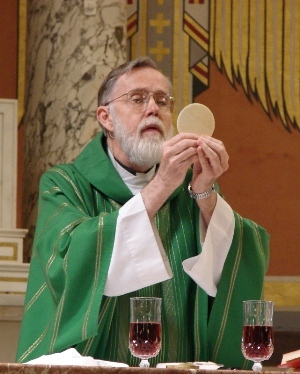 Then he took bread, and when he had given thanks, he broke it and gave it to them, saying, ‘This is my body given for you; do this in remembrance of me.’ He did the same with the cup after supper, and said, ‘This cup is the new covenant in my blood poured out for you. I am speaking to you, the founder, to help to get these messages published and circulated as soon as possible. I give to you a mighty medicine for a sick world. Mary leads you to Jesus. Never is she the end. The Father has a plan. Mary's messages have led men and will lead men to Jesus. Satan has tried to stop all efforts to publish and circulate these messages. I am the Almighty God. The funds will come when you circulate and publish these messages and rosaries under the Shepherds of Christ Publishing. I am working with the founder and Rita as messenger to renew the Church and the world. Each messenger has a very vital role in the Father's plan. The significance of these messages are being overlooked. You are not studying the messages as a whole and their content. There are five unpublished Blue Books and more than four Rosary Books which I and My Mother have given to this world in the last 14 months. I have also given 15 songs of My love. I am begging you to see to the recording and publishing of this music. I beg you to listen. This is the mighty medicine for the Church and the world to draw men to the burning love of Jesus. Please harken to My call. I will send you the money. You must study and read these messages. This is a fulfillment of Fatima - these messages were given to bring priests to the burning love of Jesus. I am Jesus, your beloved Savior. Jesus: I thought of My intense love for you — that many would go to heaven because of My suffering — and I continued to the top of the hill. At the top they laid Me on the cross and with a big hammer nailed My hands to it. It was the worst (suffering) yet. My hands were nailed with big nails and the big hammer. Oh, it was unbelievable! Then, as if that weren’t enough, with a big nail they nailed through both feet. that I have spoken to you. Remain in me, as I in you. this distorted world – THE TRUTH! ! in the Hearts of Jesus and Mary. God and helping to build the Kingdom of God. that the peace of Christ is spread on this earth. manual (in 8 languages with the Church’s Imprimatur). 3. School Rosary Program and Junior Shepherds of Christ Ministry. 5. Special retreats and adoration before the Blessed Sacrament. 6. Apostles of the Eucharistic Heart of Jesus. 7. Promoting the rosary to all, rosary meditations. 8. Prison Ministry to promote prayer and spiritual renewal. 9. Handmaids and Servants of the Good Shepherd. 10. 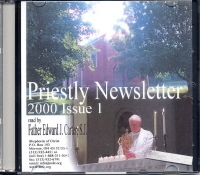 Audio/Video Departments (priestly newsletters on tape). 11. 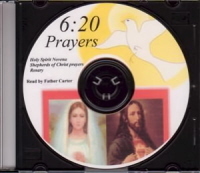 Prayer books, newsletters, newsletter books, and other spiritual aids. thrown on the fire and are burnt. We want to follow Christ! We are to witness to Christ! We are to live in the truth! Mary: My dear children, I give to you, my Son, Jesus, born in a stable in Bethlehem on Christmas morn. He is the Almighty God, the Light of the World.